Feels great on your feet. Looks cute too. 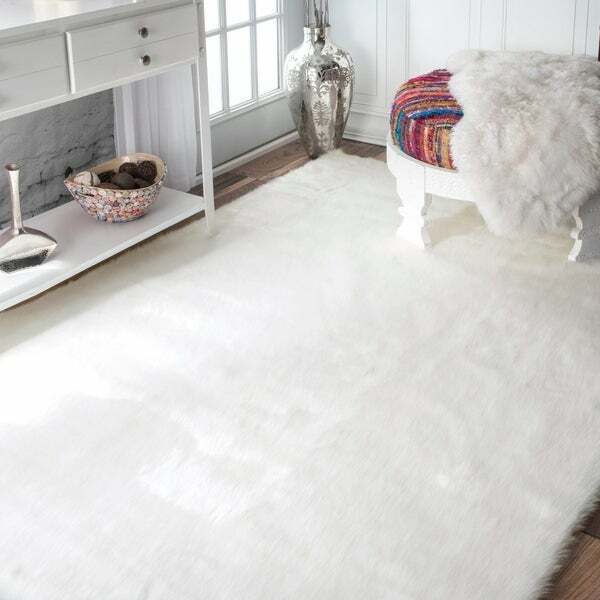 Make every day in your house feel like a walk in the clouds with this Silver Orchid Faux Sheepskin Rug. Constructed with the finest quality of Japanese yarn, the comfort of this plush shag rug will feel like a revelation every time you walk on it. Sumptuous! Silky soft at first touch. After owning this rug for nearly a year it is still soft and fluffy but the silky soft texture did wearoff after the first vacuuming. That's likely my fault though as I hadn't told my maid about the special vacuuming requirements. Yet even still, it looks and feels good. The price is also a must have factor! Very reasonable for such a high quality rug. Last note: I spilt red punch on the rug shortly after I bought it. It went everywhere and I freaked!!! But, I rinsed it, then sprayed Shout spot remover all over it and let it sit for about 3 days. In the interim, I ordered a replacement rug thinking that stain wasn't ever coming out! On the same day my replacement rug arrived (I rinsed out my stained rug and VIOLA!!! All the red punch stains were gone!!! Unbelievable. So, I wound up giving the replacement rug to a friend as a housewarming present and she loves her new rug, too! You'll have no regrets on this purchase. Enjoy!! Love the rug! I bought a rug pad to go underneath it and it feels like I am walking on a cloud! Great price too! Ordered "white" but received more of s beige like color. Super soft. 2 stars for bring inaccurate with the color. Instead of a rug, I use this beautiful faux sheepskin on my 8 foot sofa. It's the perfect size and the backing helps to keep it in place. Very cozy and soft. Exactly what I expected. Looks beautiful and fits perfectly around my coffee table. This rug is just what i wanted. I wanted a pure white faux sheepskin rug, that had a longer more wispy shag. This totally delivered. Very soft on the feet as well! My niece wanted a soft pink rug for her big girl room and she loves it. The color is the perfect shade of pink. It feels so cozy and warm. Everything about this rug is just absolutely perfect. I have been looking for a plush white rug for my master bedroom. I have checked several storesand site and came across this rug, after reading all the positive reviews I decided to take a chance a purchase as well. I received the rug fairly quickly and immediately open. I was very pleased with the softness of the rug, which felt like I was stepping on a cloud. However, I gave this product a 4 star only because I wished it was thicker. I started the return process and changed my mind. I decided to keep it. The rug is absolutely gorgeous to look at and feel as well. I would recommend to anyone wirh a disclaimer of personal preference on thickness level. This rug is exactly as pictured and described on the website. It is very plush and soft. YOU MUST BUY THIS! It's so soft and beautiful. It hugs a wood floor so no liner underneath is needed. I put this my bed...when I wake up, I love that soft feeling underfoot. I bought this rug for my daughter's nursery. It is great! The only complaint I have is that it does shed a lot, but that was to be expected. Very soft! I bought this for my grand daughter's bedroom to go along with her cute bedroom set in white. It gave such a fun pop of color to her room and is so soft that it is her favorite place to color and read. It does show the dirt but washed up nicely! Such a fun purchase to make her room look cute! Beautiful rug. We have it in our master bedroom. It is soft (not real sheepskin soft, but you get what you pay for) and a true ivory white. It does shed a bit, but not too much that it gets everywhere or is unbearable. Overall, i am very happy with my purchase and would purchase again. Very classic, soft shag rug. Shag does get dirty, so it needs to be cleaned regularly to keep it looking nice. If you have pets I'm not sure I'd recommend this one. This is a great, fluffy rug. We used it to stage a house and many potential buyers commented on the beauty and softness of the rug and asked where they could buy it. I am not sure how it will ware but it looks beautiful and a lot more expensive then it is. I like the feel of the rug. I look s nice in front of my fireplace. Very beautiful and feels amazing, better than what I expected. Well worth the price! Worth the buy!! It most definitely met my expectation. I have it beside my bed. So nice to step on when I really don't want to get out of bed. The cat thought it was a large predator for a while but loves sleeping on it now. "What shade of pink is this?" "Is this a 5x7 ft rug?" This rug is a 5-foot square. "Does anyone know if this rug can be machine washed? I’ve used it for 3 years in my son’s room and it’s finally needing a spruce up!" We do not recommend machine washing these rugs as this may damage it. We recommend using a slightly damp rag for spills and messes. For long term care, we recommend professional cleaning. This Shag rug may shed in the beginning but should subdue after a few weeks. This item should not shed too much, if any, given that it is machine made. "What to use to spot clean it"
Shout stain remover spray works wonders on getting out stains in this rug. Spray on stain, let sit for 20-30 mins (if a deep set stain, less time if fresher iir lighter color stain), rinse and pat dry.